Whenever you’re at a loss picking out a particular workshop tool for your DIY projects, it’s always a good fallback position to settle on a famous brand. At least, they’re famous for a reason, right? That’s one way to look at the DEWALT DW758 8-Inch Bench Grinder, as it illustrates why the Dewalt brand has attained such a lofty status in the power tools industry. It comes with a ¾-horsepower (4.2 amps) induction motor and it enables the grinding wheel to run at 3600 RPM. That’s a good enough speed for most grinding tasks. This is a rather hefty machine. It’s not really big as it measures just 16 inches. It’s just that the weight comes in at 39.5 pounds, and that’s not always a weight everyone can carry easily. The wheels measure eight inches, and you have both the 36-grit for faster material removal and the 60-grit for general grinding projects. The wheel guards have exhaust ports at the rear, so that the machine operates much more smoothly. The distance between the wheels is 12.5 inches, so you have more space to work with for your metal workpieces. It has substantial tool rests against the wheels. They’re made of aluminum and they’re adjustable, too. It comes with large eye guards. They’re certainly large enough so that you can be very sure that sparks and other debris from the grinding don’t fly out straight to your eye. These eye guards are adjustable, too, and you don’t need tools to adjust them. You must still use safety goggles as a matter of course, but at least it won’t be too likely that you’ll need those goggles. It’s also a Dewalt, so at least it’s not some cheap, flimsy knockoff. It’s durable enough to come with an impressive three-year warranty. It also comes with a one-year free service warranty, so that they can work on your grinding machine if anything’s wrong with it for the next year. The motor is powerful enough for most tasks. The 3600 RPM speed is certainly fast enough, and the motor has enough juice so that the wheel won’t slow down too much when in contact with your workpiece. That’s the kind of power that can let you use the machine for sharpening your tools, shaping various metal pieces, and deburring. It can be used to clean and polish your metal pieces when you have an option wheel, and the wheels you already get are good for removing rust. It doesn’t take up much space in your workshop or in storage. The industrial cast iron base really makes sure that the machine stays in place when you’re working. It sure can be annoying when you’re working and your machine seems to walk out on you due to the vibrations. You also have plenty of leeway in your work space. The wheels are more than 12 inches apart, and the aluminum tool rests are bigger than what you normally find in other grinders. Those tool rests are adjustable, too. Even the eye guards are easy to adjust. When it’s time to remove the wheel to put in another type of wheel, the eye guards can be removed very easily so you can just make the swap with no problem. You don’t even need tools to adjust these guards or to snap them in place. The warranty is very long and that’s always a good indicator of durability. Where’s the light? Seriously, most new grinders have lights because they’re not so expensive and yet they’re so useful. That’s the problem with units like these that were launched several years ago. At the time, lights weren’t a mandatory feature for grinders. There may be some issue with wobbling wheels. It’s not as if most people get this problem, as 80% of reviewers report no such difficulty. Yet even now this problem crops up every now and then. It’s no problem to have the unit replaced, but it’s such a tedious wait. It’s a bit on the heavy side. It’s not really easy to carry all by yourself. What you have here is a solidly-built machine that comes with a strong enough motor to do the work you intend to do. It doesn’t have much in terms of bonus features, but then you don’t really need those extra features anyway. If you want to get extra wheels for added versatility, a stand, and a light for your workspace, you can just buy them. 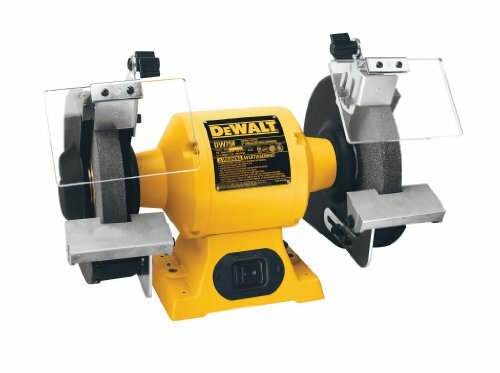 The DEWALT DW758 8-Inch Bench Grinder works quickly and simply. It’ll do the job you ask it to do and it’s very reasonably priced. You’re not wasting your money with this. 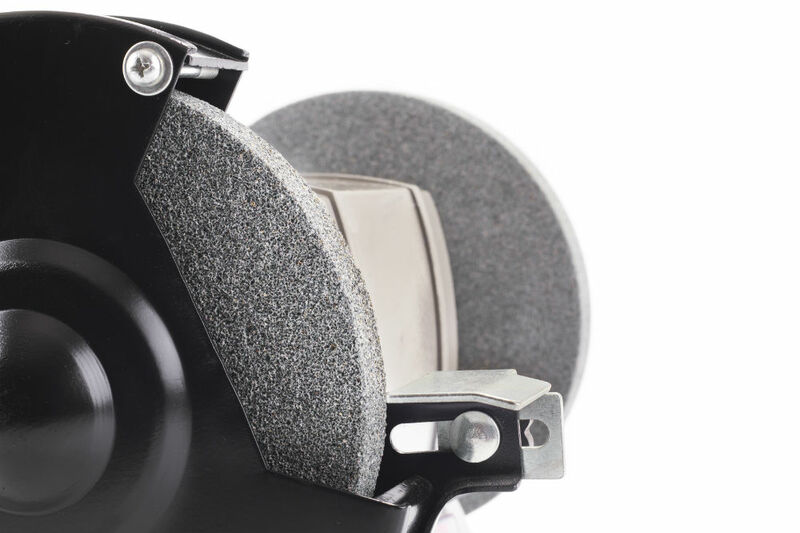 Check The Precision Tools Guide for The Best Bench Grinders.